The Wall of Fame page is one of my favorite pages on this site. It is a good thing that a webpage has unlimited height. Each season, more and more names and numbers (oh, how I do love numbers) take their rightful place as memories frozen in time. This Wall of Fame takes no admission. Heck, there isn't even a dress code! All you need is working internet to enter and poke around. Let's take a look at several noteworthy accomplishments for the 2016-2017 IHSA Wrestling season. At the bottom of this article lies the statistical truth about the team leaders in a variety of categories. Club soda | Waiting for the two young men above is Jason Renteria. Jay welcomes Jaime and Tony to the OPRF Wrestling Century Club. Jaime and Tony are two wrestlers who have joined the Century Club this season. Jaime Hernandez, a senior, finished his career with a 115-34 record. In the past three seasons, Jaime earned three state medals (4th, 2nd, and 5th respectively). He committed to wrestle at the University of North Carolina in the upcoming school year. Tony, a junior, earned a 106-8 record in his first three years at OPRF. Tony has two state runner-up medals and hopes to ascend the ladder in 2017-2018. Jay completed his Huskie tenure with a 144-8 record. He medaled in all four years (2nd, 2nd, 1st, and 1st respectively). 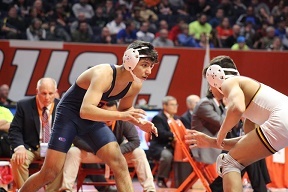 Jay is also the third Huskie to earn an undefeated season (Mike Powell Isaiah White), and Jay is the third Huskie to gain four IHSA state medals (Larry Early, Isaiah White). The Century Club now boasts 22 members. The captain that steers the ship | Paul Collins has now completed his third IHSA season as Oak Park & River Forest Wrestling Head Coach. In his three opportunities, Coach Collins has guided the Huskies to a beautifully odd (or perhaps, oddly beautiful) 77-7 dual record. In this trio of campaigns, OPRF has won two state titles, three conference titles, and 21 individual state winners (6 champions). Read more about the OPRF Achievements on this site. Coach Collins and his staff are relentless preachers of discipline, growth, respect, and pride. Medaling magic | Head Coach Paul Collins is an alumnus of OPRF, and several other alumni of the OPRF Wrestling program are taking their shots at national championship glory. This weekend, Isaiah White is battling the NCAA Division II Championships. He attends Notre Dame (Ohio). On March 5, Sam Brooks completed his second consecutive Big Ten championship as a member of the Iowa Hawkeyes. He shoots for All-American status in the NCAA Division I Championships on March 16-18. Both tournaments (and the NCAA Division III Championships) are hosted on TrackWrestling. Double vision | Jason Renteria added to his banner year by embracing the top of the leader board for both takedowns (260) and falls (30 pins and techs combined). Last year, Peter Ogunsanya, a senior this season, also earned both titles. Congratulations to Jay on being the Takedown King and King Pin. Pick six | The Huskies fell short in their bid for a fourth consecutive IHSA title, but they have won the last six West Suburban-Silver Conference titles. In addition, the Orange & Blue are victors of the six most recent Regional team titles. OPRF aims for lucky seven in 2017-2018. Numbers game | Enough of the commentary; below are the 2016-2017 statistics leaders. Enjoy! Wins 41 Jason Renteria Sr.
Losses 0 Joe Chapman Fr. Takedowns 260 Jason Renteria Sr.
Nearfalls-3 33 Jason Renteria Sr.
Nearfalls-2 43 Anthony Madrigal Jr.
Total Nearfalls 67 Anthony Madrigal Jr. Reversals 11 Anthony Madrigal Jr.
Escapes 62 Brian Holloway Sr.
Falls 16 Jason Renteria Sr.
Tech Falls 16 Anthony Madrigal Jr.
Total Falls 30 Jason Renteria Sr.
Majors 8 Brian Holloway Sr. Decisions 13 Drew Matticks Sr.
Forfeits 3 Nico Bolivar Fr. Defaults 3 Jaime Hernandez Sr. The 2016-2017 IHSA Wrestling season came to a close on Saturday night, and sadly for those supporting the Orange & Blue, the Huskies' campaign ended several hours earlier. Much like falling to Minooka (2009-2010) and Sandburg (2012-2013), OPRF fell in the quarterfinal round to a highly skilled opponent. Being that the semifinalists wrestle for all four team trophies, the Huskies could do nothing but begin to prepare for their offseason regimen. Oak Park & River Forest concludes the season with a record of 21-4 overall, 6-0 in conference. Coming in, all knew the strength of a Montini lineup. It would be a back-and-forth affair, and the team that executed the most (or perhaps at the most opportune times) would advance. The dual started well for the Huskies. Jay Renteria opened the dual with a fall at 132 pounds. Jaime Hernandez followed with a decision victory to put the Huskies up 9-0. The Broncos countered with wins from Jacob Stiles (over Eddie Ordonez) and Will Lewan (over Jack Fisher). After four bouts, the Huskies led 9-7. The 160-pound match was a pivotal bout with Montini's Matt Ortiz finding 6 points over our own Brian Holloway. At 170, Drew Matticks put the Huskies back in the "W" column with a decision. Tariq Thurman kept the needle moving in OPRF's direction with a major victory. At this point, the Huskies led 16-13. A Peter Christiansen tally (over Elijah Osit) knotted the team score until Christopher Middlebrooks won his 220-pound bout by major decision and Michael McNicholas succeeded by a slim margin (over Talvin Gibson). Heading into the 106, 113, 120, and 126-pound matches, the Huskies held a 20-19 lead. Montini's lower weights tipped the dual into the Broncos' favor. Dylan Ragusin (106) toppled Nico Bolivar, Joe Melendez (113) survived in a triple overtime thriller versus Peter Ogunsanya, and Real Woods (120) earned a major decision versus Eddie Bolivar that sealed the Huskies' fate. At 126 pounds, Tony Madrigal was awarded a forfeit victory to cement the final team score: Montini 29, OPRF 26. Montini was able to advance to the championship bout, but Lockport prevailed to take home the title trophy. In the third place dual, Lincoln-Way West defeated Deerfield. After witnessing the team handshakes before shutting down my computer, I had a glimpse of satisfaction and joy. Despite the loss, I felt quite proud of our team, our program, and our family. How many high schools would give an arm or a leg (figuratively, of course!) to be in a position like the Huskies have found themselves for the past several years? It's a great honor to go toe-to-toe with the best high school wrestling teams in the state. A familiar adage lectures, "You win some; you lose some." On this day, the scoreboard said that we lost, but the Huskie Wrestling Family is a winning entity. There are no hesitations about this certainty. Dual Team Live/Archived Results | Visit the Dual Team State tournament on TW. Watching on the Web | Some of you may have watched Dual Team State Finals duals on IHSA.tv. Huskies' eyes are in the moment. A late February trek down to Bloomington, Illinois, is not an uncommon event for Huskies and their fans. In the U.S. Cellular Coliseum, Oak Park & River Forest earned its first IHSA Dual Team State Title. This program achievement took place during the 2008-2009 season. Fast forward eight years, and the Orange & Blue Wrecking Crew is looking for its fourth consecutive dual title and fifth overall. Aside from the Huskies, seven other squads are competing in the Class 3A bracket. As you might guess, Class 2A and Class 1A will also be wrestling as they conduct their own end of season tournaments. The format of each team competition is as follows: the top half of the bracket (the top two duals) will be wrestled simultaneously at 9:00 AM. Thereafter, the bottom half of the bracket (the bottom two duals) will be wrestled simultaneously on the same two mats at 11:00 AM (or as soon as the first two duals conclude). A crucial point to know is that the losers of each quarterfinal pairing are finished for the day. There are no consolation rounds until after the semifinals; the two semifinal losers will dual for the third place trophy. The semifinals will be wrestled at 2:00 PM, and the championship round will begin at 5:30 PM (per the online bracket but at 6:00 PM per the IHSA manual for managers). As you see, the winners of Marmion/Lockport and Lincoln-Way West/Wheeling will quarrel in the semifinal round. The victors of Conant/Deerfield and Montini/OPRF will, too, lock horns in the semis. If you are familiar with these squads, there certainly is a lot of history -- both in this season and in recent ones -- with and without the Huskies. As a fan of wrestling, competition, and chess play, you should be in for a very enjoyable day. Prices | Dual Team State Final costs $7.00 per session (2). Times | Dual Team State Sessions: 9:00 AM & 6:00 PM (Saturday). OPRF will wrestle their quarterfinal dual at 11:00 AM. Dual Team Live/Archived Results | All IHSA Wrestling Dual Team Finals will be hosted on TrackWrestling. Dual Team State brackets will be hosted on TrackWrestling, as well. Visit the Dual Team State tournament on TW. If you do cannot arrive at the tournament, and you don't want to internet stream the event, you will be able to follow live on TrackWrestling. Watching on the Web | For a paid subscription (feel free to browse the options to see if there is a fit for you), you can watch all Dual Team State Finals duals on IHSA.tv. If you bought a monthly pass prior to the Individual State Final, you will be fine for Saturday. The Huskies entered Tuesday night's action in Hoffman Estates with a mission. That mission was simple: advance. How can the squad move past St. Charles East and enter the 8-team state finals tournament this coming Saturday? Well, a mix of starters and reserves did the trick to the tune of a 35-21 conclusion. At Conant High School, OPRF (21-3, 6-0) earned nine bout victories while the St. Charles East Fighting Saints took five. (St. Charles East is ranked #17 in Class 3A.) It was a nice win for the Huskies, but their eyes and minds are squarely devoted to Saturday's action. Remember that on Saturday, OPRF will wrestle at 11:00 AM (approximately). 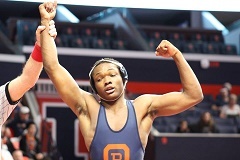 With a quarterfinal victory, OPRF will once again wrestle at 2:00 PM and 6:00 PM in the medal round. For more on the Dual Team State Series, view the previous article below. As for Tuesday night's action, the Orange & Blue enjoyed the first two victories of the dual, opening at 182 pounds, with Tariq Thurman and Elijah Osit's triple overtime thriller at 195. Another victory came at heavyweight with a decision by Christopher Middlebrooks. Nico Bolivar and Peter Ogunsanya had back-to-back major wins at 113 and 120. At 132, Tony Madrigal earned a technical fall. A bit later, Jaime Hernandez, Jack Fisher, and Brian Holloway took three in a row from 145-160. Also wrestling for the Huskies were Talvin Gibson (220), Jake Rundell (106), Eddie Bolivar (126), Torry Early (138), and Darian Nichols (170). The win paired the Huskies with Montini in Saturday's quarterfinal round. Dual Team Live/Archived Results | All IHSA Wrestling Dual Team Sectionals will be hosted on TrackWrestling. 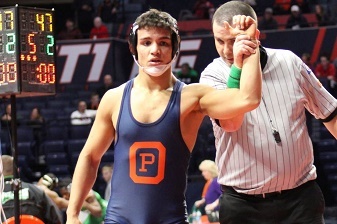 Visit the Conant Dual Team Sectional tournament on TW. Dual Team State brackets will be hosted on TrackWrestling, as well. Visit the Dual Team State tournament on TW. Watching on the Web | At this time, it doesn't appear that the OPRF-St. Charles East Dual Team Sectional dual will be broadcasted online, but the IHSA will broadcast the Dual Team State finals on Saturday. A secondary option to traveling to Bloomington is to follow the action on your computer or tablet. For a paid subscription (feel free to browse the options to see if there is a fit for you), you can watch all Dual State Finals duals on IHSA.tv. If you bought a monthly pass prior to the Individual State Final, you will be fine for Saturday. Tonight begins the "second" second season in the Illinois High School Association Wrestling State Series. On Tuesday night, each of three classes (Classes 1A/2A/3A) will hold eight duals to determine the final eight schools who will participate in the Dual Team State Quarterfinals on Saturday, February 25, at the U.S. Cellular Coliseum in Bloomington, Illinois. These eight duals are considered Dual Team Sectionals. The eight teams advancing to Saturday's final bracket will wrestle with a purpose: the top four finishers will earn a state trophy. In Saturday's tournament, a first round (quarterfinal round) win is vital. The four dual winners become semifinalists and are guaranteed two more duals. These four will earn state medals, although the places will be wrestled out. For the teams who lose their first Saturday dual, their season officially comes to a close. Oak Park & River Forest is the three-time defending Class 3A champions. If you've been around the message boards (sometimes, it's better to be away), the chatter has been that this year is wide open in the Class 3A team title race. The top five teams, according to Illinois Matmen/Go Earn It rankings are Lockport, OPRF, Marmion, Mt. Carmel, and Montini (respectively). All five are in the Dual State Series. Other Regional winners in the top ten include #6 Lincoln-Way West, #7 Deerfield, and #9 Sandburg. Adding layers of intrigue are dual results from this year's IHSA campaign. Lockport is undefeated as a team and beat Mt. Carmel, Lincoln-Way West, and Sandburg. OPRF downed Lincoln-Way West, Deerfield, and Marmion. Marmion outlasted Mt. Carmel and Sandburg. Mt. Carmel controlled both Montini and Lincoln-Way West. Montini owns a victory over Marmion. Lincoln-Way West proved victorious over Sandburg and Deerfield. Have you wrapped your minds around all of this? 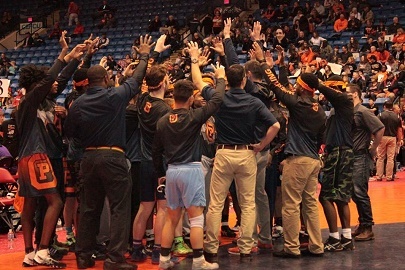 Remember that OPRF's three losses are all against out-of-state opponents at The Clash national duals tournament. Team participation and advancement (Dual Team State Series) | 16 schools in each of three classes have advanced to their respective Dual Team Sectional. These sixteen advanced by way of winning their Regional tournament on February 6. On Tuesday night, each participating squad will only wrestle one dual. The 8 winners will advance to Saturday's eight-team final tournament in Bloomington, Illinois. Team seeding | Teams are not seeded at any point during the Dual Team State Series. Matchups are determined through a lottery; however, teams facing off in the Dual Team Sectional come from the same Individual Sectional pool. In other words, two of the four Regional team winners in any particular Sectional will wrestle on Tuesday. The other two Regional victors will also dual. At Saturday's final team tournament, two teams from each Sectional will be represented. Rounds and times | For OPRF, Tuesday's dual versus St. Charles East will take place at 6:00 PM. Tuesday's action will take place at Conant High School in Hoffman Estates. On Saturday morning, two quarterfinal duals take place at 9:00 AM. The remaining two quarterfinal duals will take place at 11:00 AM. The winner of the OPRF-St. Charles East dual is in the bottom half of the bracket and will wrestle at 11:00 AM (approximately). State semifinals take place at 2:00 PM. The losers in the semifinal round will wrestle for third place. The winners will wrestle for the championship. The final medal round begins at 6:00 PM. The top four dual teams (all four squads advancing to the semifinals) are guaranteed a state trophy. Prices | Dual Team Sectional costs $5.00. Dual Team State costs $7.00 per session (2). The sessions are set to begin at 9:00 AM (quarterfinals and semifinals) & 6:00 PM (medal round). Thank you for coming out and supporting the Huskies thus far. If you can, please consider joining us at Conant and/or in Bloomington! Go Huskies! Watching on the Web | At this time, it doesn't appear that the OPRF-St. Charles East Dual Team Sectional dual will be broadcast online, but the IHSA will broadcast the Dual Team State finals on Saturday. A secondary option to traveling to Bloomington is to follow the action on your computer or tablet. For a paid subscription (feel free to browse the options to see if there is a fit for you), you can watch all Dual State Finals duals on IHSA.tv. If you bought a monthly pass prior to the Individual State Final, you will be fine for Saturday. With one week to go (don't go anywhere, folks), the curtain fell on the 2016-2017 IHSA Individual State Finals. For the vast many and many, Saturday's closing marked their exit from the IHSA season. Only the few Regional champions (from Saturday, February 4) will have the opportunity to wrestle this upcoming week for team glory. Team Orange & Blue sent ten young men to Champaign-Urbana. Half of these headed back to Chicagoland with ribbon and medal around their necks. The highest finish went to Jay Renteria. The now four-time finalist and two-time state champion outlasted Lockport's Abdullah Assaf 16-10 in the title bout. Tony Madrigal, also in the finals, lost his final match to season rival Real Woods, Montini, by a razor thin 1-0 score. Drew Matticks lost to the #1-ranked 170-pounder before taking care of his final matches en route to a 3rd place finish. Jaime Hernandez and Brian Holloway were bumped twice but stayed the course to end with a 5th place medal of their own. Nico Bolivar (DNP - 106), Peter Ogunsanya (DNP - 113), Eddie Bolivar (DNP - 120), Anthony Madrigal (2nd - 126), Jason Renteria (1st - 132), Jaime Hernandez (5th - 138), Brian Holloway (5th - 160), Drew Matticks (3rd - 170), Tariq Thurman (DNP - 182), and Christopher Middlebrooks (DNP - 220). Win, lose, or draw (spoiler alert, we don't have any of these any more), the Huskie Wrestling Family came out to support these ten wrestlers and this one program. We love having you, and we look forward to teaming with you to finish 16-17 on a very memorable week. 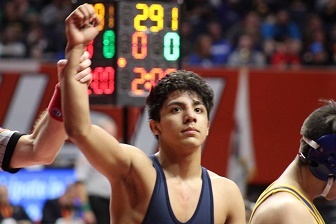 Jason Renteria ended a flawless season against state opponents. His only two losses took place at the mega-tournament Ironman in December to out of state opponents. Jay earned his 40th victory of the season in the title bout. 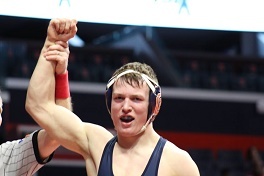 As we mentioned above, Jason's first two OPRF years concluded with individual state title losses. He rebounded last year and this, and he will walk out of the halls at OPRF with two 1st place and two 2nd place finishes. Quite impressive. Jay has committed to continue his wrestling career at Nebraska in the fall. Anthony Madrigal, a team leader as a junior, participated in his second Individual State Final. Like teammate Jay Renteria, Tony's first two trips led him to the championship bout but no further. Tony is a top-5 wrestler in the country, and his opponent is at the level just the same. Real Woods of Montini scored this latest tally, but Woods is a junior as well. More stories will be told in Tony's high school career, and he'll prepare to have one of his last end up on the top of the podium. The Huskies notched an additional three place-winners on Saturday night. Drew Matticks spent several years in the Little Huskies Wrestling Club. Last season, Drew's number in the OPRF Varsity lineup was called to a 23-17 season record. Drew had a successful campaign despite falling one win short of reaching the Individual State Final. In this year's final tourney, Drew made sure that no doubt crept in about his place among the Class 3A 170-pounders. Not only did he place, but the senior finished as the consolation champion. Drew hopes to attend Navy after graduation. Jaime Hernandez, a senior, showed his individual brilliance during his four seasons at OPRF. In his final three, Jaime earned a state medal. This year's hardware was a 5th place designation. Jaime's first (contested) bout this year was a memorable match with Anthony Cheloni of Marmion. Jaime hopes to make up for lost time with an extended run in the IHSA Dual Team Series. Jaime aspires to continue his success (is also a national Freestyle force) when he attends the University of North Carolina. Brian Holloway also participated in the Little Huskies Wrestling Club. Unlike Drew, Brian's turn in the Varsity rotation came only during his senior season. A solid, strong, and slightly unorthodox wrestler, Brian's postseason consisted of wins over all opponents (save one) not named Devin Donovan of Wheaton North. I'm sure that Brian hopes to soon forget Donovan's name, but he certainly won't forget his freshly minted medal. Brian is one of several seniors who will ready the squad this week. The Huskies have now earned at least one individual bracket board in six straight IHSA campaigns (including this year). Rob Sherrill, webcast announcer during this week's tournament, stated that the record for consecutive seasons with one state champion was 17 (currently, by Montini). I think it's at 18 after Saturday. Who knows, perhaps we'll see the Orange & Blue up there in a little more than a decade. Much more to come about this tournament and about the Dual Team Series (refocus) beginning on Tuesday night. In the meantime, catch your breath, get some rest, and be ready to follow the highly competitive team tournament this week. 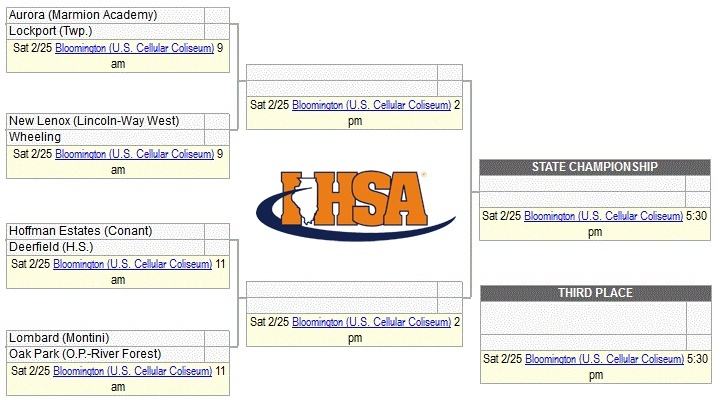 Sixteen Class 3A teams remain: the final four will leave Bloomington's U.S. Cellular Coliseum with a team state trophy. Remember, team scores were not kept at the Individual State Final (just like at the Individual Sectional). In the quarterfinal round, the Huskies finished at 3-4. Winning their matches were Anthony Madrigal (126), Jay Renteria (132), and Drew Matticks (170). By virtue of these victories, all three assured themselves of no less than a 6th place medal. During the evening session, Anthony and Jay continued their strong tournament performances with wins. They have reached the title match! Drew, once again, clashed with an unbeaten wrestlers in the semis and will wrestle on Saturday morning. If Drew wins, he will next wrestle for 3rd place. If he should lose, he will wrestle for 5th. While wrestling tough, Peter Ogunsanya (113), Eddie Bolivar (120), Jaime Hernandez (138), and Brian Holloway (160) did not advance past the quarterfinal round. In the wrestlebacks, all but Eddie took the first step towards a place on the medal stand. On Saturday morning, Peter, Jaime, and Brian must each win their bout to leave Champaign with hardware. Should a wrestler win, then he will next wrestle for the chance for the consolation championship. If Peter, Jaime, or Brian wins and then loses on Saturday, he will wrestle for 5th place. Unfortunately, Nico Bolivar (106), Tariq Thurman (182), and Christopher Middlebrooks (220) collectively saw their individual wrestling seasons come to a close on Friday. Their preliminary round opponents each -- in turn -- lost their subsequent bout, thus eliminating this talented trio from ascending to the wrestlebacks tournament. At present, the Huskies have assured themselves of three medals (Anthony, Jay, and Drew). The Orange & Blue also seek three more (Peter, Eddie, and Jaime). Best wishes to the OPRF Huskies and to the entire Huskie Wrestling Family! Huskie Pride!! Assembly Hall -- er -- State Farm Center held preliminary rounds (round of 16) bouts in all three IHSA Wrestling classes on Thursday night. Seven Huskies came out of the fire unscathed; three did not earn victories. The winners were Peter Ogunsanya (113), Eddie Bolivar (120), Anthony Madrigal (126), Jay Renteria (132), Jaime Hernandez (138), Brian Holloway (160), and Drew Matticks (170). Falling in the tightest of bouts were Nico Bolivar (106), Tariq Thurman (182), and Christopher Middlebrooks (220). These three hope their round one opponent defeats the opposing quarterfinalist to reach the semifinals. Only wrestlers who lost to semifinalists will gain a consolation tournament opportunity. As for the Huskie victors, these wrestlers advanced to the Class 3A quarterfinals on Friday morning. A win puts each on the medal stand, and a loss begins the long road in the wrestlebacks. All seven are guaranteed at least two more bouts. Well, well, well. 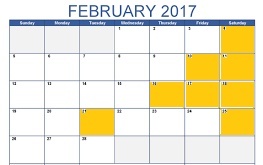 We've heard about "February" for months. This weekend promises the final chapter in the individual saga of Illinois High School Association Wrestling (say that five times fast!). Tens...hundreds...thousands of spectators will flock to the University of Illinois (Champaign-Urbana campus) to revel in this great sport in this great state. Out of 14 Regional hopefuls, 10 remain. Beginning on Thursday, the Orange & Blue Wrecking Crew will let "the best of the best" know exactly what it means to wrestle six minutes against an OPRF Huskie. Spoiler alert: it's not fun. The 10 Scoville Scurriers are a senior-heavy group. 7 Huskies are in their final season at OPRF. Following them are one junior (Tony Madrigal), one sophomore (Eddie Bolivar), and one freshman (Nico Bolivar). Here, now, are all ten wrestlers -- with weight class -- in the Individual State Tournament (Class 3A) : Nico Bolivar (106), Peter Ogunsanya (113), Eddie Bolivar (120), Anthony Madrigal (126), Jason Renteria (132), Jaime Hernandez (138), Brian Holloway (160), Drew Matticks (170), Tariq Thurman (182), and Christopher Middlebrooks (220). Tip #1 -- Four wins out of the gate will win the state title. Tip #2 -- The wrestleback bracket will consist of wrestlers who fell to semifinalists only. If -- in the first round -- Wrestler A loses to Wrestler B, and Wrestler B loses in the second round, then Wrestler A is eliminated from competition. In all other cases, wrestlers will have an opportunity to keep wrestling. Tip #3 -- All semifinalists are guaranteed to medal. At worst, they are guaranteed 6th place. Tip #4 -- If wrestlers meet a second time in the tournament, the first decision does not affect the second meeting. Both have the opportunity to wrestle for the win. Tip #5 -- Team points are not officially tallied. The IHSA, unlike several other states associations, only recognizes a team champion via the Dual Team State Series. Typically, other states employ a points system in the individual tournament to crown the team champion. Still others crown both -- team champions from the individual state tournament and a dual team tournament. Prices | State Final costs $8.00 or $10.00 per session (5) / $40.00 or $50.00 per all-session pass. Times | Individual State Final Sessions: 1:00 PM (Thursday), 8:30 AM & 7:00 PM (Friday), 9:00 AM & 5:30 PM (Saturday). Brackets | The IHSA Wrestling Individual State Final (all three classes -- 1A, 2A, 3A) will be hosted on TrackWrestling. All brackets AND live results will be posted on TrackWrestling. Visit the Individual State Brackets. Watching on the Web | Certainly, for some, coming to Champaign is a great difficulty. A secondary option is to follow the action on your computer or tablet. For a paid subscription (feel free to browse the options to see if there is a fit for you), you can watch all bouts from the tournament on IHSA.tv. A subscription lasting through next weekend (or later) will also cover the Dual State Series. OPRF, of course, will be involved in this tournament. 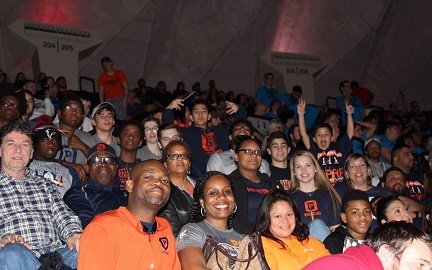 The Huskie Wrestling Family will show strong support under the lights of the State Farm Center, and if it's not too late, we encourage you to make a trip of your own! 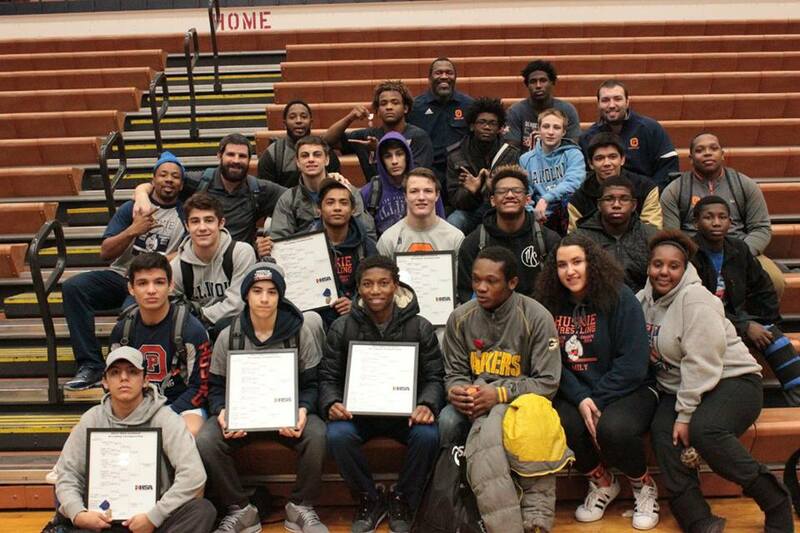 Entering Conant's two day tournament, Oak Park & River Forest brought a Regional championship along with 13 certified tickets to compete for a spot at State Farm Center in Champaign-Urbana. From that baker's dozen, an even ten reached that height. The other three -- a trio of juniors -- impressed in their own right and showed mettle to create exciting potential for their ultimate IHSA seasons in 2017-2018. Jack Fisher (145), Eddie Ordoñez (152), and Elijah Osit (195) came to wrestle their all. They ended Friday night with a defeat and knew that they needed to come back and take three straight for their first taste of the biggest individual stage in IHSA Wrestling. Undaunted, they plowed through their first two Saturday opponents. In the final challenge, all three wrestled with full Huskie Hearts, but each would not advance. Expect two things to happen in the upcoming future: 1) these three will cheer and participate to the best of their abilities during the dual team series and 2) these three will allow their drive to vault them into very successful senior seasons. Those who did survive the gauntlet included five champions: Nico Bolivar (106), Peter Ogunsanya (113), Tony Madrigal (126), Jay Renteria (132), and Drew Matticks (170). Coming in second were Eddie Bolivar (120), Brian Holloway (160), and Tariq Thurman (182). Placing third were two: Jaime Hernandez (138) and Christopher Middlebrooks (220). For these ten, they will return to action on Thursday of this week for the three day IHSA Individual State Finals tournament. Each of the final 14 brackets in each class (OPRF is in Class 3A) have 16 competitors. In each weight class, the top 6 will medal. 106 | Nico Bolivar (1st, 3-0) | Another Bolivar knocked off a formerly unbeaten wrestler; Nico is rolling. 113 | Peter Ogunsanya (1st, 3-0) | Peter is poised for his final run at the medal stand. 120 | Eddie Bolivar (2nd, 2-1) | A twist of fates won't slow down this talented sophomore. 126 | Anthony Madrigal (1st, 3-0) | Tony methodically controls a match and his opponents. 132 | Jason Renteria (1st, 3-0) | Jay is staking a claim on Pin King status with his strong showing. 138 | Jaime Hernandez (3rd, 3-1) | Ranked #2 in IL, Jaime likely will need to solve Austin Gomez for a title. 145 | Jack Fisher (DNP, 3-2) | A rematch from Leyden stalled Jack, but he is eager to contribute in duals. 152 | Eddie Ordoñez (DNP, 2-2) | This junior will be ready for a senior season to remember. 160 | Brian Holloway (2nd, 3-1) | Brian is undefeated in the state series except against Devin Donovan. 170 | Drew Matticks (1st, 3-0) | Drew is making the most of his final season. 182 | Tariq Thurman (2nd, 2-1) | Tariq's stingy defense has suited him well thus far. 195 | Elijah Osit (DNP, 2-2) | Perhaps wrestling under the radar, the junior's game elevates each week. 220 | Christopher Middlebrooks (3rd, 3-1) | Christopher collided with an unbeaten wrestler in the semis. Final team scores | Team scores were not kept and are inconsequential. What's next | OPRF sends 10 to the U of I Individual Finals Tournament on Thursday, Friday, and Saturday, February 16-18. Thank you to all of the Huskie Wrestling Family members who contributed or came out to this weekend's Individual Sectional competition! And...happy Valentine's Day, everyone! The Hoffman Estates (Conant) Individual Sectional began on Friday night. All wrestlers had an opportunity to wrestle at least one bout; first round winners toed the line for two. The Huskies, you'll remember, sent a baker's dozen wrestlers into the tournament field. Of the 13, an even 10 advanced to the semifinals: Nico Bolivar, Peter Ogunsanya, Eddie Bolivar, Tony Madrigal, Jay Renteria, Jaime Hernandez, Brian Holloway, Drew Matticks, Tariq Thurman, and Christopher Middlebrooks. These wrestlers must win one of their next two bouts to qualify for the state championships. A trio will now try their luck in the consolation bracket: Jack Fisher, Eddie Ordoñez, and Elijah Osit. These wrestlers must win their next three bouts to qualify for the state championships. For Saturday, the spectator costs of this event are $5.00 per session (2). The sessions are slated to begin at 10:00 AM & 3:00 PM (Saturday). If you are able to travel to Hoffman Estates, please consider attending...rockin' the orange and rockin' the blue! Brackets | All IHSA Wrestling Individual Sectionals will be hosted on TrackWrestling. All brackets AND live results will be posted on TrackWrestling. Visit the Conant Individual Sectional tournament on TW. Look for Individual State brackets on TrackWrestling, as well. Repeat the feat! A year ago, the Illinois High School Association also directed OPRF to attend the Hoffman Estates (Conant) Individual Sectional. That tournament went pretty well for the Huskies; Oak Park & River Forest qualified 11 wrestlers for the 3A Individual State Tournament -- 7 of whom were Sectional champions. Look for the Huskies to perform well in this go-round, also. The top-4 in each bracket will punch their ticket to participate in the IHSA Individual Finals to be held Thursday-Saturday, February 16-18, at the State Farm Center on the campus of the University of Illinois (Champaign-Urbana). For a list of the OPRF Individual Sectional qualifiers, visit the 2016-2017 Postseason page. Conant will host mat action in each of fourteen (standard weights of 106-285) brackets comprised of twelve wrestlers each. Remember that each of the four Regional champions gain a bye in the first round of competition. For example, Nico Bolivar (106 pounds) was a Regional champion; he will wrestle only once on Friday night. For all non-champions, individuals will wrestle in the opening round at 4:30 PM on Friday afternoon. Should a wrestler win in the opening round, this wrestler is pitted to wrestle against one of the four Regional individual champions in the following round (to begin at approximately 6:30 or so). Because this is an individual tournament only, team scores are not officially scored. There are no team awards or trophies for each Individual Sectional. 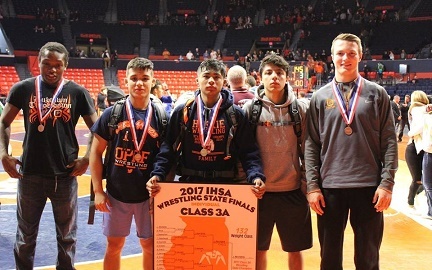 While the IHSA team champions and place-winners will occur in an upcoming chapter, the IHSA Class 3A #2-ranked Oak Park & River Forest Huskies made no confusion as to who the #1 squad was at the Leyden Regional on Saturday. OPRF sent 13 to the finals, and 11 of these returned to Oak Park with bracket boards. The lone entrant who did not qualify for next week's Individual Sectional was heavyweight Ashford Hollis. Ashford is just a sophomore, and he gave a spirited effort on both Varsity and Junior Varsity this year. Look for Ashford to begin to come into his own as a upperclass heavyweight next year. The Huskies were heavy favorites to win both the team race at Leyden and have the most champions. Wheaton North, ranked #11 in Class 3A, was the only team that could come within a stone's throw of agitating the Orange & Blue Wrecking Crew. Prior to the medal round, the Falcons did push the Huskies and had the Huskies at arm's length. OPRF's head-to-head dominance in the finals -- interestingly enough, 11 consecutive final bouts pitted OPRF versus Wheaton North -- eliminated any chance of a a team upset. Overall, the tournament operated smoothly in spite of scores of byes and several incomplete rosters. As you recall, high schools have the right to submit up to fourteen wrestlers into the Regional competition; however, due to other factors (injuries, eligibilities, weights, or simply available personnel), a high school may summon 0-14 warriors to take the stage. The Huskies and Falcons both submitted a full lineup -- the only two schools to do so -- at the Leyden Regional. Because of the team's victory, the Huskies enter the now 16-team Dual Team State Series (for 3A class schools). This tournament will begin on Tuesday, February 25, at a yet-to-be-determined high school. 106 | Nico Bolivar (1st, 2-0) | The fabulous frosh is continuing to make a big first impression. 113 | Peter Ogunsanya (1st, 2-0) | At 113, Peter is a force to be reckoned with. 120 | Eddie Bolivar (1st, 3-0) | Eddie outhustled previously unbeaten Charles Faber (GW) in the finals. 126 | Anthony Madrigal (1st, 2-0) | Even under the slightest duress, Tony is cool, calm, and collected. 132 | Jason Renteria (1st, 2-0) | Nebraska-bound Jay had no trouble with #9-ranked Frankie Indelli to win. 138 | Jaime Hernandez (1st, 2-0) | A top contender in 3A (and in the country) notched two tech-falls. 145 | Jack Fisher (2nd, 2-1) | Jack's confidence grows despite meeting a top-five competitor in the finals. 152 | Eddie Ordoñez (1st, 3-0) | Eddie wrestled a really nice tournament and expects it to continue. 160 | Brian Holloway (2nd, 1-1) | Brian is a living example of how the Huskies don't rebuild, they reload. 170 | Drew Matticks (1st, 3-0) | For Drew's opponents, the sky was falling (3 pin victories). 182 | Tariq Thurman (1st, 2-0) | After sitting out the OPRF tourney, Tariq was on top of his game. 195 | Elijah Osit (1st, 2-0) | Perhaps wrestling under the radar, the junior's game elevates each week. 220 | Christopher Middlebrooks (1st, 2-0) | Christopher's inspired performances are a joy to watch. 285 | Ashford Hollis (DNP, 0-2) | Ashford continues to grow and will be a force among 285 lb-ers. Final team scores | The Huskies scored 264.5 team points. Second and third were Wheaton North (216.5) and Leyden (102.0). 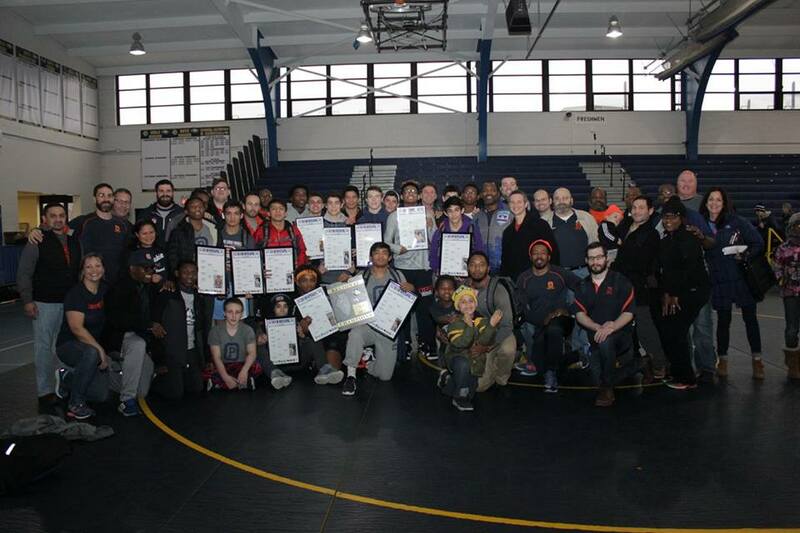 What's next | OPRF sends 13 to the Conant Individual Sectional Tournament on Friday and Saturday, February 10-11. Thank you to all of the Huskie Wrestling Family members who contributed or came out to today's Regional competition! Consider this a kind reminder that the Huskies will wrestle at East Leyden tomorrow (Saturday) in the nine-team IHSA Regional Tournament. East Leyden is located at 3400 Rose St., Franklin Park, and the tournament is slated to begin at 9 AM (finals at 2 PM). Admission is $5.00 per session (9 AM / 2 PM) or $8.00 all day. For more on the Leyden Regional and the IHSA State Series, jump to our previous article from Wednesday. Here at OPRFWrestling.com, we will take a glimpse ahead before looking back. While we prepare to recognize the warriors from last weekend's conference championships (here, acknowledging the past while anticipating the future), we will work to set the stage for the IHSA State Series (in other words, the IHSA Postseason). 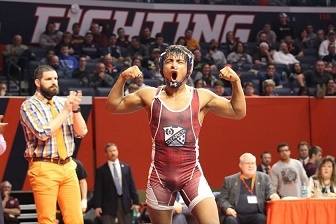 Below is a State Series primer (my favorite new word this season) to get you familiar with the in's and out's of IHSA Wrestling's February entity. We look now at details of this month, edited from last year's version. Why reinvent the wheel, right? The Huskies begin their Class 3A Dual Team Champion four-peat attempt this Saturday, February 4, at East Leyden High School (Franklin Park). Nine teams will be in attendance. Below is our quick primer on what you need to know to be ready for February action. Team advancement | On Saturday, OPRF will compete alongside eight other squads at the Eagles' home of Leyden High School (Franklin Park campus). Including unofficial state rankings, these teams are: Addison Trail, Glenbard West, Leyden, Proviso East, Proviso West, #2 OPRF, Schurz, #11 Wheaton North, and York. This team grouping is identical to a year ago when the Regional took place at Glenbard West. On Saturday, only the winning team who outpoints the others will win the Regional and advance to the Dual Team State Series. Team scoring | Team points are gained by wrestlers' place finish and manner of advancement. Certainly, higher place-winners earn more points, and winning matches by fall/forfeit/default/disqualification (+2 bonus), technical fall (+1.5 bonus), or major (+1 bonus) results will further help your school. Winning a match earns 2 points in the championship bracket; a successful win earns 1 point in the consolation bracket. This advancement bonus will be waved for all medal round matches. Final team points are as follows: 14 points (first place), 10 points (second place), 7 points (third place), and 4 points (fourth place). Wrestler participation and advancement (Leyden Regional) | Schools have the right to enter up to 14 wrestlers -- one for each weight class. These wrestlers can be regular starters, lower level wrestlers, or freshmen. The wrestlers must qualify, however, for their intended weight class. Regional tournament seeding meetings will be held on Thursday, February 2. At these meetings, teams submit their starting lineups for the upcoming regional. Since there are nine participating schools at OPRF's Regional, at maximum there can be 9 wrestlers at one particular weight class. The top three (3) wrestlers in each weight class qualify for the Individual Sectional Tournament to be held Friday-Saturday, February 10-11, at Conant High School (Hoffman Estates). Wrestler participation and advancement (Conant Individual Sectional) | Four Regional Tournaments merge to form an Individual Sectional. The four (4) individual champions will receive a first round bye, while the other eight wrestlers will wrestle in their preliminary round matches. Of the 12 wresters, the top third (the four place-winners) will punch their ticket to Champaign and the State Finals. Getting into the place matches is vital. Although the results of the 1st/3rd place bouts do not factor into qualification for Individual State, they will affect beginning bracket location under the newly remodeled Assembly Hall -- er, State Farm Center (February 16-18). Team scores are not kept at this tournament and are considered irrelevant. Wrestler participation and medals (U of I Individual State Finals) | Four is the magic number yet again, as four Individual Sectional Tournaments join to create the State Finals bracket. The four Individual Sectional champions will be seeded and placed in corresponding locations on the bracket sheet. The other 12 wrestlers (2nd/3rd/4th place Ind. Sectional finishers) will be scattered mathematically in the pairings. No byes are provided for any of the 16 wrestlers. Only wrestlers who lose to an eventual semifinalist will qualify for the consolation bracket; four wrestlers per weight class will be one-and-done. The top 6 finishers will earn medals. This three-day tournament includes full wrestlebacks with no walkovers (in other words, previous decisions from the championship bracket are ignored if two wrestlers meet again in the consolation bracket). Prices | Regional costs $5.00 per session (2) or $8.00 for an all-day pass. Individual Sectional costs $5.00 per session (3). State Final costs $8.00 or $10.00 per session (5) / $40.00 or $50.00 per all-session pass. For Dual Team State, Team Sectional costs $5.00 for the event. Dual Team State Final costs $7.00 per session (2). Times | Regional Sessions: 9:00 AM and 2:00 PM (Saturday). Individual Sectional Sessions: 4:30 PM (Friday), 10:00 AM & 3:00 PM (Saturday). Individual State Final Sessions: 1:00 PM (Thursday), 8:30 AM & 7:00 PM (Friday), 9:00 AM & 5:30 PM (Saturday). Dual Team Sectional Session: no later than 5:30 PM (Tuesday). Dual Team State Session: 9:00 AM & 6:00 PM (Saturday). Tournament videos | Individual State Finals are broadcast on www.IHSA.tv (subscription options are available). The finals will be rebroadcast on CSN Chicago. Brackets | All IHSA Wrestling Regionals (yep, all 48 Regionals in 3 classes) will be hosted on TrackWrestling. All brackets AND live results will be posted on TrackWrestling. Visit the Franklin Park (Leyden) Regional tournament on TW. Look for Individual Sectionals brackets on TrackWrestling, as well. Dual team tournament | More information on the Dual Team State Series will come in a few weeks. 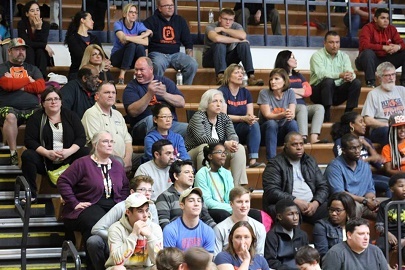 Should OPRF win its Regional, the hosting school for the corresponding Dual Team Sectionals round has not yet been determined, although the date of that event would be Tuesday, February 21. In the meantime, follow the Orange & Blue Wrecking Crew in this February frenzy! Go Huskies!